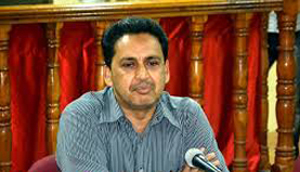 Mangaluru, Aug 1, 2015 : Chairing a meeting on July 31, DK DC Adoor B Ibrahim took officials to task for failing to furnish details on the implementation of Prime Minister’s 15-point programme for the welfare of minorities. The deputy commissioner said that the officials should furnish details on the progress made in the last financial year and also during the present year, in the next meeting which will be held within a month. Meeting is being conducted after nine months still officials have yet to furnish details on the implementation of the programmes. He said that the officials should have complete details on the number of poor without land and also those who do not have ration cards in the district. Out of 127 school dropouts in Dakshina Kannada district, a total of 112 students have been brought to the mainstream of the society. The progress of the remaining 15 students will be checked and a report will be submitted soon. Under MGNREGS - Mahathma Gandhi National Rural Employment Guarantee Scheme , 11,337 job cards have been issued to minorities and 918 have availed the employment. The target for the district under Indira Awaz Yojana is 3,182, of which 1,421 are from minority communities. The selection process of beneficiaries in progress at the gram panchayat level. Under Basava housing scheme, the target set for the district is 7,300. The MLAs in each constituency have to select the beneficiaries. Out of the total target, 10 per cent has been earmarked for the minorities. Assistant Labour Commissioner Nagesh said that the Labour department extends financial assistance for the registered construction workers in case of mishap, death, for the construction of house, for marriage and education purposes. A total of 38,000 construction labourers have been registered in Dakshina Kannada district. A team of officers from Labour department will visit to the construction sites to create awareness on the need for registration. The registered labourers should renew their registration once in three years. Since 2014, assistance worth Rs 1.20 crore has been given to the construction workers in the district. Construction labourers from other states do not show interest in registering their names with the Labour department. Mishaps in the quarry sites and sand mining sites do not come under the Labour department of the State government.